It’s not what you say; it’s how you say it. This truism is particularly relevant for teachers who spend their days standing in front of a group of young people helping them learn critical life skills and academic concepts. Throughout a school year, your students will become familiar with many intricacies of your body language and will likely get to the point where they can tell if you are pleased or displeased—based on just the smallest movement—even before you say anything at all! 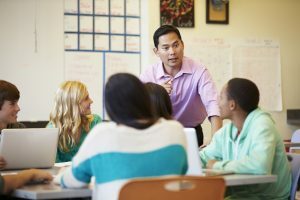 The idea that your non-verbal cues can have a significant impact on your effectiveness as a teacher may not be something that you think about too often. The relationships that you develop with your students are critical to student performance and academic achievement. According to experts from the National Education Association (NEA), the most effective teachers use body language to communicate with students, build rapport, and make them feel safe and supported. Your body language also conveys authority and credibility and is as essential to fostering a positive and productive learning environment as your lesson plans themselves. Follow the tips below to help bring awareness to yourself to improve your rapport with your students. Maintain eye contact. When speaking with a student one-on-one, face him or her directly—this simple gesture demonstrates engagement and consideration. Focus on posture. Standing tall with your shoulders back is good for your health and conveys confidence and success. Show your hands. Hands are trust-indicators. Crossing your arms across your chest, placing your hands behind your back, or in your pockets might communicate that you are uninterested or not approachable. Use an open-body gesture such as an upturned palm and open arms (rather than crossed arms) to indicate you are open and accepting of anything your students want to share. Maximize your classroom space. Move around the room. Doing so helps keep students’ focused and will give you an opportunity to make more direct eye contact with every student—not just those in the front of the room. Smile every chance you can! If this list of body language best practices feels overwhelming, start by focusing on just one or two items at a time. Begin with your posture, then focus on eye contact, and then moving around your classroom more often. Soon, these behaviors will become second nature, and you will be taking note of the positive impact your non-verbal cues are having on your hard-working students.